Are you looking for a place where you can totally relax? Spa Costa del Sur is the place for you. With more than 40,000 square feet, 27 treatment rooms, 4 couples suites, a couples co-ed wet area and a full-service salon, relaxation is our specialty. Our spa is designed to pamper, relax and rejuvenate. We offer one of the most extensive spa menus in the city. Some of our most popular treatments include our Pure Fiji Goddess of the Sun Ritual and Just For You Facial. We offer the most cutting-edge treatments for men, women, couples, and teens. A visit to Spa Costa del Sur steam, sauna, whirlpool and treatment rooms will leave any guest feeling like they can take on the world, or at least the sights and sounds of Las Vegas! For reservations please call 702-797-8030 or click here. We are located in the heart of the southwest Las Vegas valley, just minutes away from the famous Las Vegas Strip. Some of our amenities include a 16-screen Century Theatre movie complex, 64-lane bowling center and restaurants that cater to all appetites and tastes. Our casino features a large selection of table games and the latest slot and video poker machines while our hotel features spacious rooms and suites with 42-inch LED televisions, Point Plush mattresses and Wireless Fidelity throughout. Unique to this property is our Arena and Equestrian Center, which is the finest horse facility in the USA. South Point also has a fabulous 400-seat showroom that features headliner entertainment and dancing to live bands on weekends. 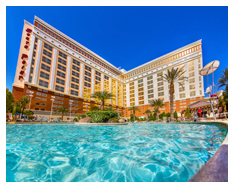 Stop by the South Point Hotel, Casino & Spa today, we are sure you will want to stay.